Submitted photo The Wright State Model UN team received an Outstanding Delegation Award and numerous student won individual honors at the annual National Model UN Conference. 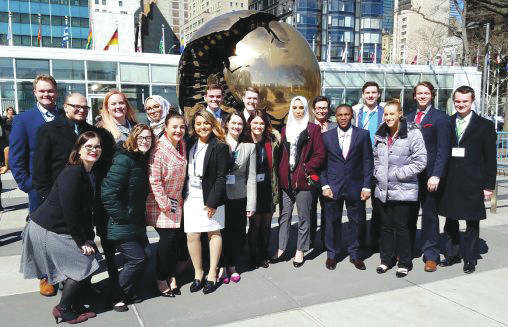 FAIRBORN — Wright State University’s Model United Nations program has always been a point of excellence for the university, growing into a world-renowned program since its inception in the 1970s. For the 39th consecutive year, the Wright State Model UN team received an Outstanding Delegation Award — the highest honor — at the National Model UN Conference in New York City March 18–22. Two pairs of Wright State delegates received peer awards for Outstanding Delegates in Committee: Stephanie Patino-Gargias and Lana Jones in the World Health Organization and Jakob Puckett and Tanner Row in the International Telecommunication Union. Wright State represented the Republic of Turkey in the competition. Students received a briefing in New York by the Turkish Mission to the United Nations. This year’s team was led by head delegates Amanda Baker and Crystal Burns, both students in the Master of Arts Program in International and Comparative Politics Program. The Model UN team is advised by Vaughn Shannon, associate professor of political science, and Liam Anderson, professor of political science. During the Model United Nations conference, students participate as delegates to various UN committees, competing against teams from other universities. Participants research and formulate political positions based on the actual policies of the countries they represent. To prepare for the competition, Wright State delegates researched several topics like cybersecurity, humanitarian assistance, the spread of drugs and how to change it and what to do about chemical weapons. Next year will be Wright State’s 40th anniversary participating in the National Model UN Conference in New York. https://www.fairborndailyherald.com/wp-content/uploads/sites/50/2018/04/web1_2018-model-un-508×327.jpgSubmitted photo The Wright State Model UN team received an Outstanding Delegation Award and numerous student won individual honors at the annual National Model UN Conference.